To get the replica looking so true to the real thing, the original series’ production designer, Tho. E. Azzari, served as creative consultant on the project, using sketches, Polaroids, and even color swatches from his own archives. The diorama also features more than 100 discrete pieces: Yes, there’s the ever-present green bike hanging on the wall by Jerry’s bathroom, the microwave in which Elaine over-nukes her muffin in “The Hot Tub,” and the blue-gray couch whose cushions Kramer sits on while guarding the armoire in “The Soup Nazi.” Now, if there were a miniature replica of George’s miniature replica of the boardroom for the Susan Biddle Ross Memorial Foundation inside this miniature replica, we’d be really impressed. 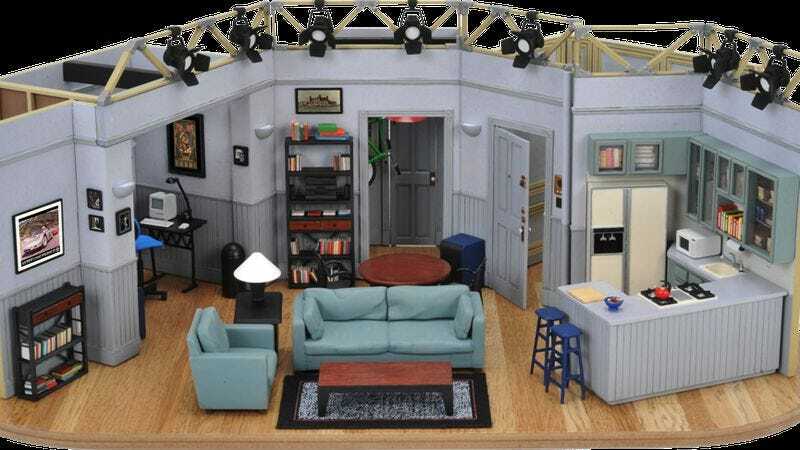 Fans who purchase the set will have to provide their own Jerry, Elaine, George, and Kramer figurines, of course, but perhaps they have a peanut M&M toy or some fusilli pasta lying around.